Opus Dei is a subordinate organization to the Pope, who is in control of the Knights of Malta, and therefore there are Knights of Malta in Opus Dei. The Jesuits control Opus Dei through the hierarchy of the Pope and through the Knights of Malta. Opus Dei is composed of prominent Roman Catholic businessmen and politicians who have given themselves over to “God’s work”—that’s what Opus Dei means—for making the Pope the Universal Monarch of the world, ruling the world from Solomon’s rebuilt temple in Jerusalem. An example of this is the former head of the FBI, Louis Freeh, was a member of Opus Dei. And so, we now understand the Waco incident, where those White Protestants were killed; it was the work of the Opus Dei. And we also have to remember that the sharpshooter, one of them there, was a Japanese Roman Catholic, Lon Horiuchi. 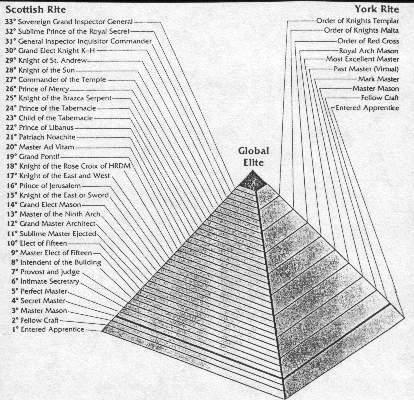 But Opus Dei is determined to create a World Government under the Pope. Opus Dei was created in the 20th Century, whereas the Knights of Malta were created in the 11th Century, and the Jesuits were created in the 16th Century, in 1540, with Ignatius Loyola. John McCone was a very powerful industrialist, and one who was part of the military-industrial complex, before he became the head of the CIA. He later went on to become part of, I believe, ITT. John McCone was another Knight of Malta, head of the CIA, and participated in the Kennedy assassination by virtue of him being its head. And he's Knight of Malta. The Jesuits obviously wrote the Protocols because they have carried out every protocol in that little handbook. Alberto Rivera says that it was Jews aligned with the Pope who published the Protocols. Well, I tend to feel that it was just the Jesuits themselves because they and they alone, were the ones who were able to bring this to pass. They're the ones in the government. They're the ones behind professional sports. The owner of the Pittsburgh Steelers is a Knight of Malta. The owner of the Detroit Lions is a Knight of Malta. All your top owners of these ball clubs, for the most part, are Knights of Malta, getting the people whooped up in this hoopla over games and sports, while they're busy creating a tyranny. So, that was one of the things in the Protocols-that they would create 'amusements'. Well, the Jesuits had brought in all of their top Nazi SS soldiers into the CIA because the Jesuits were using the SS to kill the Jews in Europe. When the Einsatzgruppen went into Russia, the Jesuits followed with the SS and purged Western Russia of all its Jews. That's why Stalin deliberately killed 40,000 of his best officers. That's why he kicked out his best generals, purged them, because he wanted to make sure that the Red Army would lose with the advance of the German army, because following that would come the SS and purge Russia of the Jews that Stalin so hated. And by the way, justice is often poetic because Stalin's daughter married a Jew. We find that fact in Loftus' work The Secret War Against The Jews in most telling, telling detail. So what do we have? We have high-level treason and betrayal of the Jewish race; that is there in Israel today, by their own leaders, who are loyal to Rome and the Jesuit Order. And to show this, we have a great big Rockefeller edifice in Jerusalem; we have an ophthalmology center in Jerusalem run by the Knights of Malta. There's nothing but Knights of Malta, high-level Freemasonry, and the Jesuit Order running all of Israel. So what's going to happen, I believe, with the Dome of the Rock is, that has got to be removed-somehow, someway. It's on the Temple site; it has to be removed. If I was the Jesuit General, I would make- somehow, someway-American bombers do it. Because I want to create universal hatred for this nation of the United States, because in the United States there are more Protestants and more Jews than any country in the world, and 'we've' got to kill all those people. So what better way than to create a Jihad, a Moslem fanatical attack against the United States, coupled with a Chinese invasion from the East. That's what I think is going to happen. The Jews are not going to destroy that Temple site because, if they do, Rome will destroy their efforts of rebuilding the Temple. Because, if Moslems control all of Jerusalem, that Temple will never be rebuilt. It has to stay in Jewish hands-because the Jews, and rightfully so, need their own homeland. They're entitled to the nation. And they haven't had their own Temple of worship. They are rightfully entitled to that. But what they don't know is that they are being used by the Jesuits to rebuild their own Temple, that they would love to have rebuilt, for the Pope, so he can sit there and be the man of sin, the Anti-Christ of the Book of Daniel, Chapter 9. That's what I see coming for Israel. The American Pope is the Cardinal of New York. He is the most powerful Cardinal in the United States. He is what's called 'the military vicar'. The military vicar is in command of all of the military orders within the United States, they being the Knights of Malta and the Knights of Columbus. He is also in command, and privately, of 'the Commission' because Cardinal Spellman was an intimate of Joe Kennedy, and Joe Kennedy was an intimate of Frank Costello......And that Commission, you know what it controls? All of the trucking, all the supermarkets, it's power is beyond our wildest imagination, second only to the Knights of Malta. And, of course, they all control the Federal Reserve Bank. The Cardinal controls the Federal Reserve Bank through the Council on Foreign Relations. The Council on Foreign Relations belongs to the Cardinal. Spellman was not a member of it, during his day, but two of the most powerful members were Knights of Malta: Henry Luce and J. Peter Grace, and also William F. Buckley, to this day. William F. Buckley is indeed one of my enemies, because I name him, and he is a powerful multi-billionaire who participated in the Kennedy assassination, just like Iacocca, another Knight. Both of those men are subject to Cardinal O'Connor and will do ANYTHING he says........Remember that Alexander Haig is a powerful Knight of Malta. His brother is a Jesuit. So, sure they have meetings. The High Knights of Malta, who meet in their palace on Aventin Hill, in Rome, of course, meet with the Jesuit General, and so on. And Count von Hoensbroech, who was a German Noble who became a Jesuit for 14 years-he wrote a two-volume work called Fourteen Years A Jesuit. His father was a Knight of Malta. Yes, the Jesuits work in conjunction and have regular meetings with the Knights of Malta. The Knights of Malta and the Jesuits work together! (Truth seeker, this may seem irrelevant now, but it is important for you to be aware of this connection. As we shall see, the Knights financed Lenin and Hitler from Wall Street, also using their Federal Reserve Bank headed by Masonic Jews, Warburg in particular.) The Knights negotiated the Concordat (a Papal treaty) between the Pope and Hitler in the person of Franz Von Papen. They also helped top Nazis to escape to North and South America after World War II in the persons of James Angleton and Argentina's President Juan Peron. In America, the Knights, with their OSS, later the CIA, were behind 'Operation Paperclip'. After World War II, top Nazis and scientists were illegally secreted into the United States. Many were placed in the top-secret military installation in Tonapah, Nevada known as 'Area 51'. The perfection of the Nazis' anti-gravity aircraft (flying saucers) was to be completed there, among other secret technologies. 'Operation Paperclip' was overseen by America's most powerful Knight of Malta, J. Peter Grace. J. Peter Grace was subject to the Jesuit-trained Archbishop Spellman, as the American headquarters for the Knights was and is St. Patrick's Cathedral in New York. Direct excerpts from the forthcoming book by Eric Jon Phelps called Vatican Assassins.